French World No.3 Gregory Gaultier says that he is almost back to full fitness as he prepares to defend his title at the El Gouna International, PSA World Series tournament between April 20-27. The 35-year-old will make his return to El Gouna’s Marina in the midst of an injury-hit season which has seen the former World Champion suffer an ankle problem and a partial rupture of his adductor, resulting in him losing his grip on the World No.1 spot last month. Gaultier made his return to action during March’s Grasshopper Cup where he reached the semi-finals and, 12 months on from beating Karim Abdel Gawad on the banks of Egypt’s Red Sea to become the first non-Egyptian winner of the El Gouna International, the Frenchman is hoping that his injury troubles are now behind him as he targets a successful finish to the season. “It’s the worst year I have ever had,” said Gaultier. “I have had a lot of stoppages with tough injuries to come back from. I believe I can still win big things, of course, but I need my body to feel right. I didn’t have the chance this year to turn up to any events being 100 per cent, it was a horrible feeling to always try to catch up with little preparation. “I’m on my way back and I am very careful with the little details, I want to play and compete for a few more years. I will come back to El Gouna in decent shape and will be happy to play. 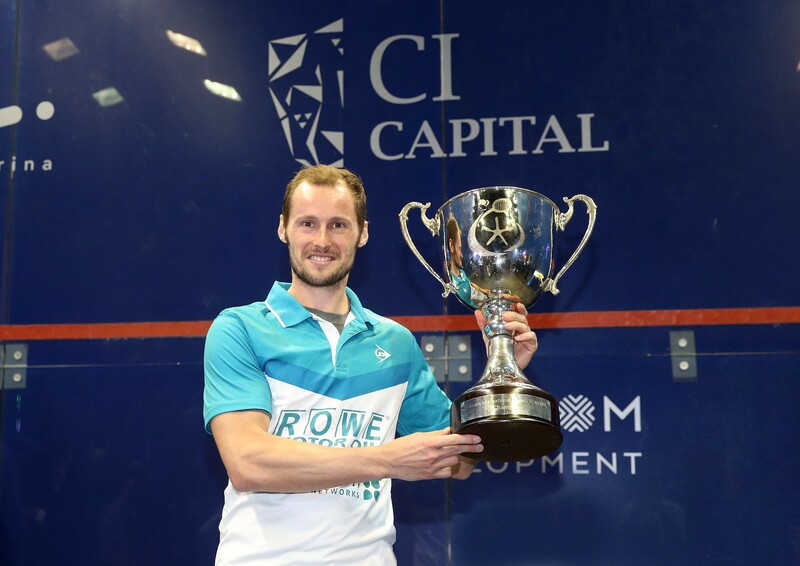 Gaultier’s title win at last year’s El Gouna International came during arguably his greatest ever spell of form as he dominated the PSA World Tour in the early stages of 2017, winning six successive PSA titles and becoming the sport’s oldest ever World No.1 in a period that also saw him go 27 matches unbeaten. “It was probably the period where I was playing my best squash, everything was going the way I wanted,” the Frenchman admitted. “It was very special to win in Egypt. Of course this is a very unique place and it’s an amazing feeling with the fireworks at the end. “Places like that are good for our sport. Lots of people come during their holidays and anybody can come and watch. Gaultier will get his 2018 El Gouna International campaign under way against Egyptian shot-maker Mazen Hesham, while he is seeded to meet U.S. Open champion Ali Farag – the man who overtook Gaultier as World No.2 earlier this month – in the semi-finals. Points for the PSA World Series Standings are also up for grabs, where Gaultier – the 2015/16 PSA World Series Finals champion – currently sits in eighth place. A top eight berth would see Gaultier qualify for this season’s edition of the World Series Finals but, with just two World Series tournaments left this season, the Frenchman is yet to guarantee his spot at the season-ending tournament. World No.1 Mohamed ElShorbagy tops the men’s draw and the Bristol-based Egyptian could face younger brother Marwan in the last four if both players play to their seedings. Meanwhile, the El Gouna International will feature a women’s World Series tournament alongside the men’s for the first time in history, with World No.1 Nour El Sherbini and reigning World Champion Raneem El Welily set to meet in the final. El Sherbini and El Welily contested the women’s PSA World Championships in El Gouna last April – with El Sherbini prevailing – but the two Egyptians will face strong opposition from the likes of compatriot Nour El Tayeb, New Zealand’s Joelle King, France’s Camille Serme and England’s Laura Massaro later this month. Qualification takes place between April 18-19 at the El Gouna Squash Complex, while the main draw will be held between April 20-27. Main draw matches will be split between the glass court situated at El Gouna Marina and the qualification venue. Matches held on the glass court will be shown live on SQUASHTV (Rest of World) and Eurosport Player (Europe only), while action from the semi-finals and finals will be broadcast live on mainstream channels around the world, including BT Sport, beIN Sports, Fox Sports Australia and Astro. 2018 Men’s El Gouna International, El Gouna, Egypt.